This recipe lends itself to modification. Jeff’s Mom used to add bacon bits, and sometimes I can get Jeff to make his wonderful pico de gallo to put in it. But this is the basic version. 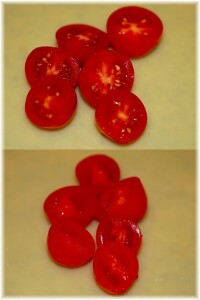 Seed 3 cherry tomatoes and dice them. I like to use cherry tomatoes because they are easy to seed. You simply cut them in half and run your finger inside and the seeds pop right out! 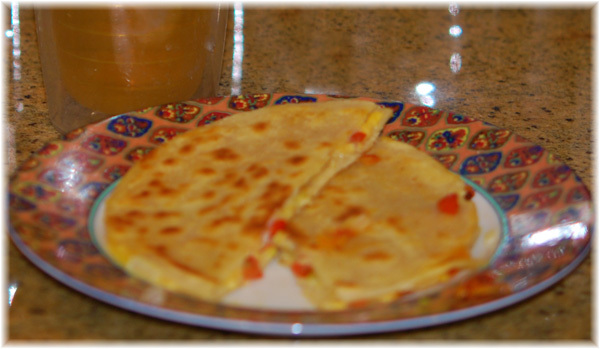 You don’t have to seed them, but if you don’t you get a juicy mess with your quesadilla. It’s just easier this way, and it really doesn’t take much time. If you don’t have cherry tomatoes, you can substitute about a quarter of a regular tomato, also seeded, or a tablespoon or two of salsa (drained!). I haven’t tried sundried tomatoes, but I bet they would also be good. Use your imagination. Next, slice about one slice of a white onion, diced. You can use yellow or even red onion as well, if you prefer. I like white onions, but I think everyone has their preference in that regard. Just be sure you don’t dice up your fingers. I’ve done that before too. 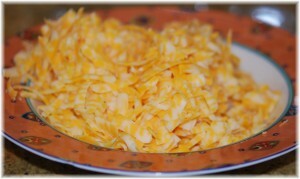 Shred about 1/4 cup of Colby-Monterey Jack Cheese. You can buy the mixture, or you can buy each and mix them. I like to shred my own, but of course you can buy the pre-shredded. I don’t think it takes all that long to shred, and I think the cheese stays fresher if it’s not already shredded. Spread about 1/4 to 1/2 teaspoon butter on one side of each tortilla. I like to spread it thin to keep fat and calories down, and I don’t really like it dripping in grease when I’m done. Add the diced tomatoes and onions, all the while keeping an eye. Your cheese should start to melt. Add your green chiles. This is also when you should add other things like bacon bits or anything else you think you would like. It’s not a good time to add things that will melt like sour cream, however. There is time for that later. Now let it sizzle lightly on the skillet until the cheese is melting. Put the second tortilla on top, butter side up. Let it sit there for a minute or so, and then, using a large spatula, carefully turn it over to allow the other side to brown. Be sure not to go do something else while it is cooking. This is a good way to cook it to a blackened crisp. I know because I’ve done it a lot of times! It can happen fast. 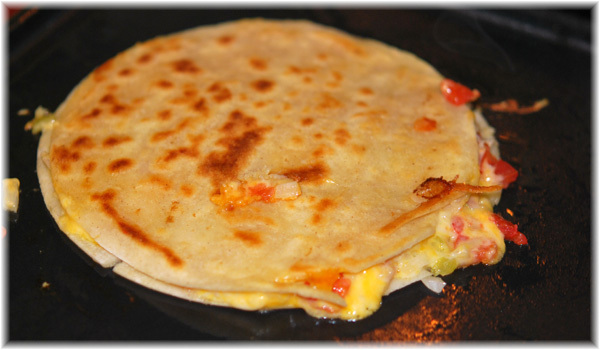 And this is what you want –a nice brown tortilla, with a little cheese crisp around the edges, melted inside, and done just right! If you like, open it up right away and add salsa or sour cream or pico de gallo or something else I’ve never thought of or eat it just like this. A perfect lunch with just a glass of iced tea. Enjoy! I should add that the Hatch green chiles I used came from here. They were excellent. You can substitute canned or another sort fresh. Depends on what you like. But it’s hard to beat Hatch green chiles! OK….I think I will make them soon. We even have the Hatch chilies. 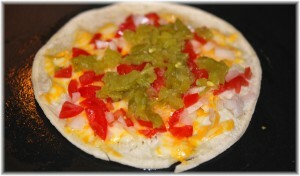 A friend of ours knows a woman who makes awesome tortillas so I will order some from her. Thanks for sharing! Oh, home made tortillas? I’m green! I have tweaked mom’s recipe a bit, and I think I hit a home-run. Not that they weren’t already great to begin with…. I get the Tyson chicken strips, like for fajitas, and dice them up a bit so that they are bite size. Put a bit of butter in the pan to melt. Sear the chicken up. Then I dump them out on a paper towel to drain but leave the pan as is. 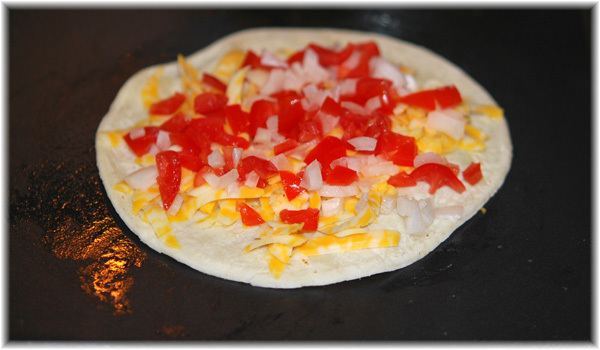 Take a burrito size tortilla, load it with the shredded cheese (we like the mixed). Then, add some cilantro leaves on top and some home made pico. Fold the tortilla in half and put in the pan to grill it up. The butter is key to a rich taste. The chicken is seasoned just right. And the cilantro leaves are that extra something special that Ron can’t get enough of! A little more work, but oh so worth it! Yes, this sounds good. More work, and Jeff prefers his without meat, etc. But for those who like it all the way, this sounds great. You really should do the Pico recipe as well. It is both good, easy (assuming you live in an area with green chilis and cilantro available) and the perfect paring with quesadillas.